Julián Castro, Democratic Presidential candidate from the state of Texas announced a plan to decriminalize illegal entry into the United States and to grant a path to citizenship for millions. Appearing on MSNBC’s, The Rachel Maddow Show last night, he discussed the import of revamping asylum and detention policies, he opposes Trump’s border wall, he supports a pathway to citizenship, and he stated that ICE should be reconstituted with a more humane and compassionate approach to immigrants. 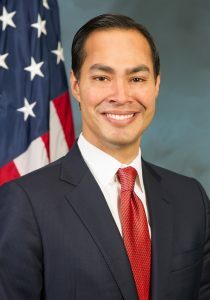 Castro was the former mayor of San Antonio, Texas and served as the youngest member of President Obama’s cabinet, as the 16th United States Secretary of Housing and Urban Development. He has quite an impressive resume, with an undergraduate degree from Stanford University and a law degree from Harvard University. He is the son of a political activist who helped to establish the Chicano political party La Raza Unida and his twin brother, Joaquin, currently serves as an United States Congressman. If elected, Julián Castro would be the first Hispanic and Latino-American President of the United States. Castro’s interest in immigration advocacy no doubt stems from the fact that his grandmother came to the United States from Mexico as a six-year-old orphan. The Shulman Law Group applauds candidate Castro for standing as the first among a large array of Democratic Presidential hopefuls to officially announce an immigration reform platform.